Home / Medical News / Medical research / How does solid stress from brain tumors cause neuronal loss, neurologic dysfunction? A Massachusetts General Hospital (MGH)-led research team has demonstrated, for the first time, how solid stress—the physical forces exerted by the solid components of a tumor—impacts the tissue surrounding brain tumors and contributes to resulting neurological dysfunction and neuronal cell death. In their report published in Nature Biomedical Engineering, the investigators identify characteristics of tumors most likely to impose solid stress, describe a potential way of distinguishing patients with such tumors, and identify the neuroprotective drug lithium as a promising treatment strategy. While the deformation of normal brain tissue by a growing tumor has been associated with greater disability and increased risk of death, the impact of specific patterns of tumor growth has not been understood. Evidence has suggested that nodular tumors—those that continue growing as a single, well-defined mass—exert greater solid stress than do infiltrative tumors, which invade surrounding tissues as individual cells. To pursue this observation, the researchers implanted either nodular or infiltrative glioblastoma cells into the brains of mice and measured the stresses that had developed within and around the tumors 20 days later. They found increased compression and deformation of brain tissue around the nodular but not the infiltrative tumors. 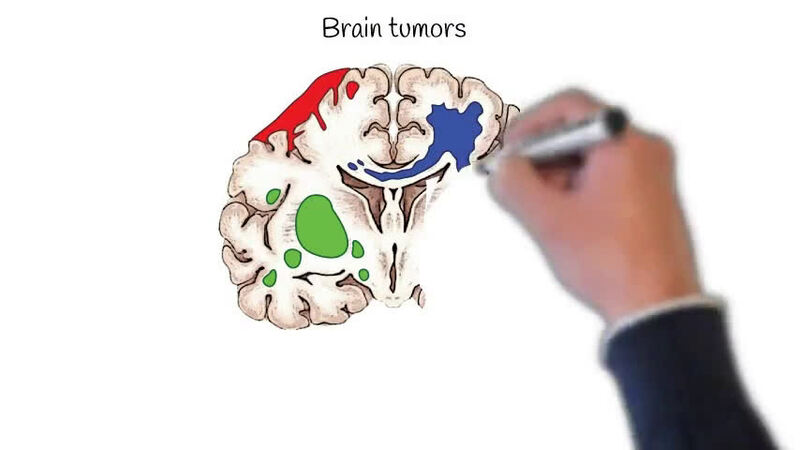 Analysis of MR images from 64 glioblastoma patients taken prior to any treatment was able to distinguish those with more nodular tumors, determined by perfectly defined tumor margins, from those with infiltrative tumors. Patients with nodular tumors had exhibited significantly poorer results than did those with infiltrative tumors on a standard assessment of functional impairment. There was no difference between the two groups in terms of tumor size or of edema caused by accumulation of excess fluids. To get a better understanding of how solid stress exerts its effects on brain tissue, the investigators used advanced imaging technology to assess blood vessels surrounding the tumors of mice with either glioblastomas or breast cancer brain metastases. They found that nodular but not infiltrative tumors reduced the perfusion of blood vessels around and at the edges of tumors. The stress induced by nodular tumors also deformed the nuclei of neurons in the surrounding tissues, leading to signs of cellular death. MR imaging also revealed reduced vascular perfusion in healthy tissue surrounding the tumors of about half the 64 pre-treatment glioblastoma patients, an observation confirmed in another group of 14 patients. In both groups, patients with reduced vascular perfusion around their tumors had greater neurologic impairment than did those in whom perfusion was unchanged. Again, tumor size and edema had no impact on vascular perfusion of surrounding tissue, and neither did pre-treatment with steroids. Reduced perfusion was most commonly seen around nodular tumors. Corroborating analyses of data from a group of 34 patients with breast cancer brain metastases, which are typically nodular, also revealed significantly reduced perfusion in surrounding healthy tissues. The researchers then used a specially designed compression apparatus to apply gradual pressure to the brains of living tumor-free mice and found that 14 days of compression, gradually increased at a rate like that of nodular tumors, produced similar effects—deformation of cortical tissues, reduction in vascular perfusion and blood vessel density, and signs of cellular distress within neurons. Behavioral testing of the animals revealed reduced movement and coordination in those with cortical compression. To investigate the effects of relieving cortical compression, which would simulate surgical removal of a tumor, the investigators used two approaches. Both removal of the cranial windows that allow direct observation of brain tissue in tumor-bearing mice and removal of apparatus-applied compression in tumor-free mice led to increases in vascular perfusion and some restoration of the appearance and number of neurons. While there was limited improvement in the animals’ physical coordination, it proved to be temporary. These experiments allowed the investigators to separate the mechanical effects of solid stress on healthy brain tissues from biological effects, such as inflammation or the release of toxic factor by tumors. To investigate whether neuroprotective drugs could help preserve function in compressed brain tissue, the researchers then treated mice during chronic, gradual compression and for two weeks after decompression with four drugs known to have neuroprotective effects. Only lithium—a drug used to treat bipolar and other psychiatric disorders—appeared to protect against damaging effects, reducing neuronal death, the amount of compressed cortical tissue and other signs of cellular distress. Lithium-treated mice also performed significantly better on tests of movement and motor coordination than did untreated animals.